This park has a basketball court, tennis court, and rec center and a small kids play structure. The rec center has restrooms and drink fountains, not to mention activity rooms too. There is a play room with lots of toys and books. 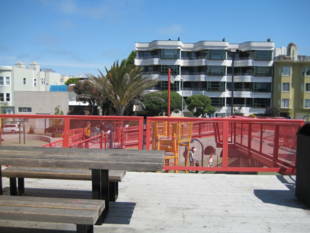 Helen Wills Playground is owned by the San Francisco Recreation and Parks Department. The rec center phone number is (415) 292-2016. 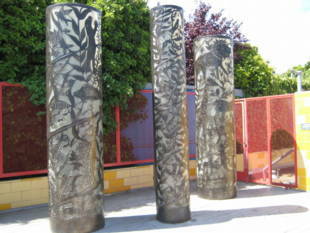 It was established in 1915 as the Spring Valley Playground. Helen Wills, born in Centerville (now part of Fremont) was 10 years old that year and practicing tennis with a passion. In 1922, the 17-year old UC Berkeley graduate (Phi Beta Kappa) had reached the finals of the U.S. championships. By 1929 she had garnered an Olympic gold medal in Paris for both singles and doubles, and had won the U.S. women's singles championship six times from 1923 through 1929. The city fathers decided that it was time to honor this native Californian and in September 1929, the four-acre site at Larkin and Broadway became Helen Wills Playground. A wall plaque records improvements were made by the WPA (Works Progress Administration) in 1935-36. Since its founding, scores of neighborhood kids have made the playground their back yard. By the late 1950s, 30 years of energetic enjoyment had taken its toll and major restoration began. Dedicated by Mayor George Christopher in October, 1961, the new facility included a rebuilt clubhouse with an activity room, craft room, kitchen, directors' office, restrooms and storage space. Floodlights poured down on the redone basketball court, combined tennis and volleyball court and softball area for youths up to 12. The children's play area held a sandbox, slides and swings. The total cost was $101,700. Fast-forward 40 years into the millennium and the playground is now number two on the 'most in need of repair' list. The children's wooden play structure has been closed since Rec. and Park workers discovered that copper arsenic in the wood preservative had leached into the soil. The department is now determining what hazards this may pose to the structure's removal or temporary rehabilitation. The clubhouse needs cleaning, painting, window protection and handicap accessibility. All the courts need resurfacing. The landscape lacks benches, tables, shade trees; the chain link fence needs replacing with something more secure and attractive. The grounds remain open, however and, not waiting for new and improved surroundings. Rec. center director Chris Huie and his assistants are running a lively summer activities program for kids 6-12. (They still talk about the day awhile back when Nash Bridges came to shoot a scene on the playground.) Teens and adults use the basketball, tennis, and table tennis facilities and Huie proudly notes that Helen Wills' table tennis and baseball teams are championship caliber. 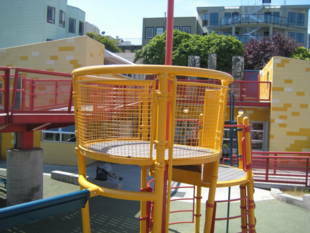 Located in District 3, the playground is high on Supervisor Aaron Peskin's priority list for action. The dedicated team at work on the project includes neighborhood activist Julie Christensen, Rec. 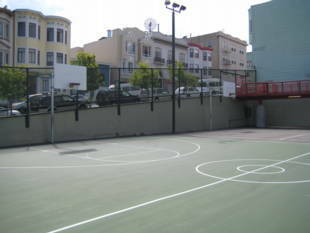 and Park project manager and landscape architect Dan Mauer, capital plan manager Gary Hoy, and Krystn Kuckelman, who, with her group of Russian Hill neighbors, formed NPC's newly-created Friends of Helen Wills Playground in early 2001. They are developing a master plan for the facility's redesign and reconstruction. To cover out-of-pocket costs for the architects, designers and engineers, who are working pro bono on the project, a fund-raising brunch is being held at Allegro Restaurant on July 22.
Financing is the next hurdle. Rec. and Park's Assessment put $743,600 as the price tag for rehabilitation of the clubhouse and playground. 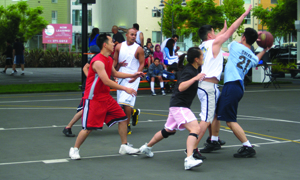 Currently the project has $400,000 from the Open Space Fund, $8l,700 from the 2000 Neighborhood Parks Bond, and the $12,500 privately raised by Russian Hill Neighbors and Peskin's supporters. The rest will have to be sought from foundations, grants and private donations.